The Tim Hortons chain was first opened in 1964 in Hamilton, Ontario. Since then it has grown into Canada's largest national chain in the coffee and fresh baked goods segment, with approximately 1,900 stores right across the country, and more than 120 locations in key markets in the United States. The first Tim Hortons stores offered only two products - coffee and donuts. The selection of donuts to enjoy was highlighted by two original Tim Hortons creations, the Apple Fritter and the Dutchie. They became the most popular donut choices in the 60's, and remain two of the most popular today. But as consumer tastes grew, so did the choices at Tim Hortons. The biggest change in the chain's product focus took place in 1976 with the introduction of the phenomenally successful TIMBIT (bite-sized donut hole), today available in 39 different varieties. The chain's growth into the 1980's brought about a whole series of new product introductions: muffins (1981), cakes (1981), pies (1982), croissants (1983), cookies (1984), and soups & chili (1985). Sandwiches, which were originally introduced in 1993, were re-introduced as a new and improved line-up of 6 varieties, called "Tim's Own", in 1998. Also, in the 1990's, bagels (1996), flavored cappuccino (1997), Café Mocha (1999) and Iced Cappuccino (1999) were introduced. And in 2000, "Tim's Own" Coffee Cake and hot Chicken Stew in an edible bread bowl were successful menu additions. The chain's biggest drawing card, however, remains its legendary Tim Hortons coffee. The special blend is also available in cans, as are Tim Hortons hot chocolate and English Toffee and French Vanilla cappuccinos, so customers can also enjoy these great tasting products at home. 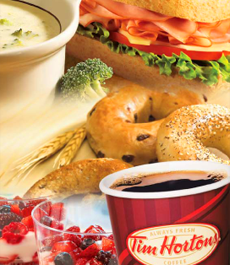 In addition to our regular standard stores, Tim Hortons locations can also be found in shopping malls, highway outlets, universities and hospitals, providing prominent visibility for the chain. Most standard Tim Hortons locations offer 24-hour drive-thru service, catering to consumers on the go. 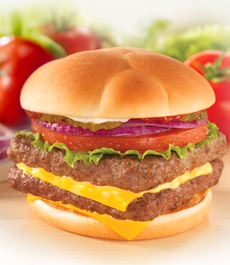 Combo unit locations, which house both a Tim Hortons and Wendy's, offer customers the convenience of both restaurants under one roof. In 1995, Tim Hortons merged with Wendy's International, Inc., giving new focus and impetus to the expansion of the Tim Hortons concept in the United States. Tim Hortons locations can presently be found in Michigan, New York, Ohio, Kentucky, Maine, and West Virginia, with responsible expansion continuing in these core markets. The Canadian operation is 95% franchise owned and operated, and plans in the U.S. call for the same key strategy to be implemented as expansion progresses.